Mapo doufu is a popular Asian dish, specifically Chinese. It is a tofu based dish, with square cut tofu chunks floating in a spicy sauce made with soy sauce, potato starch, ginger, hot bean paste, etc. Some variations of the recipe add chicken stock to the sauce, for extra flavor. It also includes ground pork meat, seasoned with onions, black beans, garlic, sake, chili oil, salt and pepper. Minced beef can also be used to cook this meal. Mapo doufu is not really a good choice if you are on a diet, but the dish may be altered to better suit an eating regimen. For example, it may be prepared with less meat, or even vegetarian. 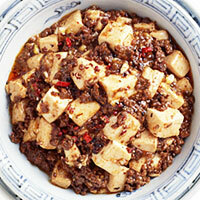 The calories in Mapo Tofu per 256.2g(1/2 a brick of tofu) is 341 calories. Mapo Tofu is calculated to be 133Cal per 100 grams making 80Cal equivalent to 60.15g with 23.29g of mostly fat、20.03g of protein、10.17g of carbohydrates in 256.2g while being rich in vitamins and minerals such as Molybdenum and Vitamin K.